For the suburb of Whangarei, see Morningside, Northland. Morningside shops, as seen from the corner of New North Road and Morningside Drive. Morningside is a suburb of Auckland, New Zealand. It lies four kilometres south-west of the city centre, close to Eden Park and Western Springs. The residential suburb lies between the suburbs of Grey Lynn, Kingsland, Sandringham, and Mount Albert, near the arterial North-Western Motorway and Western Railway line. The name comes from a farm estate called "Morningside" that was subdivided in 1865 for housing lots. 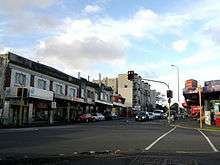 The suburb is centred on the Morningside shops which are located on the New North Road, near the Morningside Railway Station. One of Morningside's largest buildings is the 1920s brick building which formerly housed the Mount Albert Borough Council until Mt Albert was amalgamated with Auckland City in the late 1980s. St Lukes Shopping Centre is close by. The local Secondary schools are Mount Albert Grammar School, Marist College and St Peter's College. Morningside was the setting of the animated TV show Bro'Town. The Heart Of Colonial Auckland 1865-1910, Terence Hodgson. Random Century 1992. Photographs of Morningside held in Auckland Libraries' heritage collections.